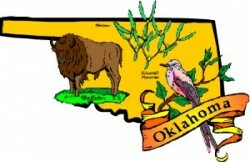 The largest city and capital is Oklahoma City. State nickname is the Sooner State. State flower is the Mistletoe. State bird is the Scissor-Tailed Flycatcher. In 1935, the first (USA) parking meter was installed in Oklahoma City. Susan Rogers Cooper: Milt Kovak Mystery Series – Milt is a sheriff. Connie Feddersen: Amanda Hazard Mystery Series – Amanda is a CPA. Jean Hager: Molly Bearpaw Mystery Series – Molly is a Cherokee Nation advocate. Jean Hager: Mitch Bushyhead Mystery Series – Mitch is the chief of police. Carolyn Hart: Nela Farley Mystery Series – Nela is a reporter in this paranormal series. Carolyn Hart: Bailey Ruth Ghost Mystery Series – Bailey is a member of Heaven’s Department of Good Intentions. Marion Moore Hill: Scrappy Librarian Mystery Series – Juanita (a librarian) and her collie/mongrel dog, Mills. Blanche Day Manos & Barbara Burgess: Darcy/Flora Mystery Series – This series features a mom and daughter sleuths. Eve K. Sandstrom (aka JoAnna Carl): (Nell) Matthews/Svenson Mystery Series – Nell is a reporter and Mike is a police detective. Eve K. Sandstrom (aka JoAnna Carl): Down Home Mystery Series – Sam is the sheriff, and his wife, Nicky, is a photographer. Donis Casey’s Alifair Tucker series set in early day Oklahoma is wonderful. Please add them to your list. Also, Carolyn Hart’s Bailey Ruth ghost series is set in Oklahoma. Gail, thank you for the Carolyn Hart reminder! Also, thanks for telling us about Donis Casey‘s Alifair Tucker Mystery Series. Sandstrom also wrote the Down Home mystery series, featuring Sam and Nicky Titus. Set on an Oklahoma ranch, it was the first thing to come to my mind when I read Oklahoma Mysteries. PlumGaga, thank you for the Eve K. Sandstrom (aka JoAnna Carl) information about the Down Home Mystery Series. I have added her series to the list. Danna quick question when do Monica Ferris’s books usually come out wasn’t it around March or so the new one won’t be out until August of next year seems like it is longer issue date for it. I’m a bit late here — getting caught up on some emails. William Bernhardt has a series featuring Ben Kincaid, an attorney in Tulsa. Marion Moore Hill wrote 2 books featuring Juanita Wells, a librarian in Wyndham, in her Scrappy Librarian books. dragons3, thank you for telling us about the Oklahoman authors!